"Recite, in the name of your Lord, who has created, has created the human being of a suspending mixture. Read, and your Lord is the Most Bountiful, who has taught through the pen, taught the human being what he[/she] did not know. Nay, surely, the human being becomes grossly overweening whenever he[/she] believes himself [/herself] to be self-sufficient. Surely, unto your Lord is the return." 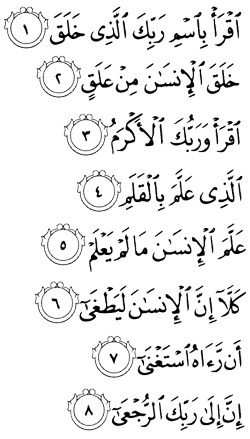 These were the first verses revealed to Prophet Muhammad about his message and his mission. Here God is reminding the human being of his/her biological origin: the mixed suspension of the sperm and egg, which although little, has all the potential of the human merits, at the top of which are the human mind and free will. The human being has been endowed with the linguistic power that gives names to all that he/she experiences. He/she has been enabled by God to turn the spoken language into written symbols, and thus the human being has been able to record what he/she knows and extend this record to others, an achievement that has been essential in preserving the history of civilization. By enabling the human being to use the pen and to learn and spread knowledge, God has helped humankind exchange and extend information over the earth. The earliest Quranic verses stress this civilizational role of the humankind on earth, where it has been entrusted with being the successive agents of God. The multi-faculties of the human being, including his/her intellect, knowledge, speech and writing, however, may lead him/her to experience illusions of power and self-sufficiency and thus transgress all bounds and deny others' rights. The verses remind a person with such a tyrannical attitude that regardless of the amounts of power that he/she may achieve in this worldly life, the return of all human beings to their Lord is inevitable, and the accountability and requital of every individual for all of his/her deeds in this life will certainly follow in the eternal life to come. When the Prophet saw people severely tried, he made the supplication: "Praise be to [God] who has given me well-being such that I was not tried like these people. And He has preferred me over so much of his creation." Compassion for those in tribulation and gratitude for well-being is how the Prophet responded when he witnessed people in difficulty. What comes to a person in his or her life may help a person move closer to God when the response is right. Ibn Abbas said that if a person is tested with a tribulation, he will find in it three blessings: first, the tribulation could have been worse; second, it was in worldly matters and not in spiritual ones; and third, it came in the finite world and not the infinite one. All three are reasons to thank God even for tribulations. It is important to look at the life of the Prophet and know that no one faced greater tribulation. The Prophet lived to see all of his children buried, except for Fatima. How many people experience that in their lifetime? Out of six children, he saw five of them perish. His father died before his birth. His mother died when he was just a boy. His guardian grandfather then died. When he received his calling, he saw his people turn against him with vehemence and brutality. People who had once honoured him now slandered him, calling him a madman, liar, and sorcerer. They stalked him and threw stones at him until he bled. They boycotted him and composed stinging invectives against him. He lost his closest friends and relatives, like Hamza, who was killed on the battlefield. His beloved wife Khadija after 25 years of blissful marriage died during the Prophet's most difficult moment. Abu Talib, his protecting uncle, also died. The Prophet was the target of 13 assassination attempts. How many people have faced all of that? Not once in a single hadith is there a complaint from him—except when beseeching his Lord. To be displeased with God's divine decree is to plunge into heedlessness (ghafla). Imam al-Qarafi distinguishes in his book al-Furuq the difference between a divine decree and being content with the decree itself. Should people be happy with all that comes their way, even the bad things? God has decreed that evil exist in the world in order to test humankind and for reasons that accord with His wisdom. We should not be displeased with His choice in allowing this. But when one sees societies plunged into immorality, it is not something to be pleased with or even feel indifferent. On the contrary, God requires that we dislike it. But never should we resent or be displeased with the fact that God has created a world wherein such things exist, however unpleasant they may be. As Ibn Abbas reminded, every trial could have been worse; it involved one's worldly affairs and not religion; and it came in this world and not the Hereafter, which lasts forever. An ayah is a sign, a pointer, or an indicator. It points humans toward a certain direction. That pointer is a guide, but only inasmuch as it continues to be followed. The Quran uses this word often. It reveals that certain circumstances, certain people, certain discussions, and certain occasions are signs guiding or pointing to understanding or comprehension of the Truth. As it said, it also proclaims itself as universal guidance (2:2), pointing all who have moral consciousness in the direction of an ethical basis for living. But ethics inevitably develops, transformed by the constant makeover of human knowledge, experience, and change. If all there is to the Quran was its grappling linguistic competency in seventh-century Arabia, we should not only still ride around the desert on camels and live without air-conditioning, we should also still enslave other human beings, accept silence as a woman's agreement, and think that the sun moves around the earth each day until it rises in the east and sets in the west, while the earth stands still as the centre of the universe. The moral, technological, economic, social, and ecological context at the time of revelation, including its linguistic utterances, was necessarily constrained by the limits of that context. The expansive and eternal intent of universal guidance toward right actions, as known to an omniscient divine, whose Self-disclosure as revealed in seventh-century Arabia, was not properly rendered but was particularized within the parameters of the social-cultural, moral, legal, and linguistic constraints of that context. If one truly believes in the eternity of the divine, then one cannot accept that Allah begins or ends with the particulars of Quranic utterances. Indeed, philosophically, limiting Allah to the utterances of the Quran, a specific text, would also limit Allah to seventh-century Arabia. The extent to which Allah's particular textual exposure is equated with Allah's totality in Its transcendent and unknowable reality is the same extent to which some think that Qur'anic patriarchy reflects Allah, rather than that context. One scholar expressed the idea that the god of the Quran is patriarchal, reducing Allah to the patriarchal contextual articulation and nothing else. That is a kind of shirk (violation of tawhid). It holds the seventh-century Arabian conceptual framework of Allah, and the epistemological constraints of that context as equal to Allah. Such thinking, which concretizes Allah to the limitation and literalism of the Quran's revelatory context, parallels the Christian discourse that literally takes the notion of God's incarnation as the body of Christ.